The common pipistrelle is the second smallest bat in Ireland but the most numerous and widespread. Their fur colour ranges from reddish brown to dark brown on the back with the abdomen being a more grey to brown colouration. Young juvenile pipistrelles have a darker fur colouartion than adults. The ears are short and triangular in shape with a rounded tip. The small short snout gives the common pipistrelle its distinctive appearance. The wingspan ranges from 20 to 25cm in length with the wing design being narrow and pointed allowing for fast agile flight. Body length ranges from 3 to 5.2cm. Adults weigh up to 8 grams at their heaviest just before the hibernation period begins each autumn but will slim down to only 5 grams in the spring. The ultrasonic pulse used by this species when hunting ranges at 45 kHz which is lower than the related soprano pipistrelle. They are a highly vocal bat species particularly while in the roost when they are preparing to emerge using chattering and snuffling sounds to comunicate, if alarmed they will emit a series of high pitched shrill calls. This bat is mainly a house dwelling species but can otherwise be found in most habitat types except for very exposed areas. The common pipistrelle is the most common bat species found in urban areas in Ireland. They prefer areas close to open water, meadows and hedgerows as these provide the best hunting grounds. Irish cities and towns provide ideal habitat locations for this bat to roost in as they will use both old and new buildings in which to establish their roost sites as long as they are located close to hunting grounds. mix of both sexes which are established inside small cracks and crevices within cavity walls where small groups will form clusters. 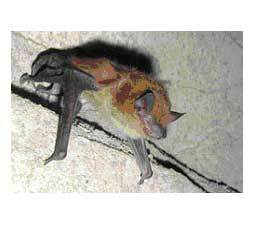 Common pipistrelles do not enter a deep hibernation like other bat species and may be active in winter if weather conditions are suitable. Common pipistrelles emerge from the roost to hunt thirty minutes to one hour after sunset, their preferred prey are less active at this time but so too are predatory birds. Depending on the weather pipistrelles may remain active for most of the night flying at between two and ten metres above ground level along favoured hunting routes at a woodland’s edge or near streetlights and other artificial light sources in urban areas. Generally common pipistrelles will not travel far from the roost site to hunt and remain within 2km if they are located in good quality habitats. This bat species targets small winged prey which it catches on the wing directly with the mouth or it may use the tail or wings to transfer the insect to the mouth. The diet of the common pipistrelle in Ireland is comprised of numerous small insects such as midges, caddis flies, moths and mosquitoes, on a successful night of hunting up to three thousand of these prey items may be consumed. The mating season for common pipistrelles starts in September and runs to November although mating can occur in any season. During the breeding season males become more aggressive and territorial and will establish mating sites within the roost which females will visit. Flight displays by the male will attract a harem of up to ten females with which he will mate. Males will develop a strong musty odour during the mating season. Once pregnant the gestation period for this bat species depends on the weather with warm summers allowing a faster pregnancy of around 44 days, in colder periods a pregnancy can last for 80 days as the female must use energy to increase her body temperature to stay warm. A single offspring but in some cases twins are born in June or July and will weigh between 1 and 1.5 grams at birth. The young bats will first open their eyes after three days and are fed solely on their mother’s milk for the first six weeks of life. They grow rapidly and are capable of solo flight after three weeks. Mothers can identify their offspring by their sent and the sound of their vocalizations. Female common pipistrelles can become sexual mature after only two months and my give birth themselves near their first birthday. Unusually for an Irish bat species some females will only breed every second year. The average lifespan of a common pipistrelle in Ireland is 7 years but some individuals have been recorded as having reached a 20 year lifespan. The present day bat family tree now contains 950 different species divided into 17 families. The common pipistrelle species belongs to the Vespertilionidae family in the Chiroptera order. Bats and pipistrelles are believed to have evolved from small insect hunting mammals which occupied the tree canopy of forested areas of the Eurasian continent. 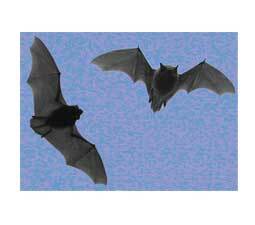 The oldest fossils which gave rise to modern bats date from 50 million years ago. Past climatic changes such as the last Ice Age seriously affected the number and range of bats but they can now be found in most habitats throughout the world except for land areas near the poles. Common pipistrelles are now the most abundant species of bat in Europe and are also widespread from southern Scandinavia to the Mediterranean. They are also found in some areas of North Africa and the Middle East. The species is absent from colder European areas of northern Scandinavia and are not found on some Mediterranean islands. Common pipistrelles are Ireland’s most widespread bat species and can be found in all countries except for on offshore islands. As some females of breeding age do not mate every year any losses of young bats can have a detrimental effect on common pipistrelle numbers locally. 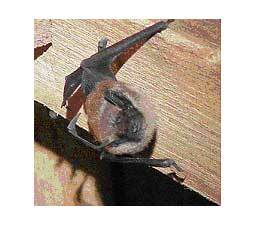 The main threats to the species comes from the practice of chemical treatments of timber frames in attics which can poison an entire colony and make the area unsuitable for bats for up to twenty years. As summer roosts are established in mature tree trunks their destruction can occur with the removal of old or dangerous trees. Recent re-forestation programs will in the future help maintain the number of suitable habitats of the common pipistrelle in Ireland once these plantations have time to mature. The increased use of pesticides in agriculture in recent decades has had a negative effect on the number of available insect prey on which the species is totally reliant, toxic accumulation of chemicals within the environment can also poison bats. Common pipistrelles are insectivorous mammals and are capable of consuming a large number of small winged insects prey on nightly hunting trips so they are a good form of natural pest control. 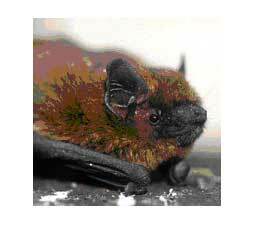 The common pipistrelle bat species is protected under Irish, European and international law.